The leaked photos of the Optimus Note from LG has been spotted in South Korea. 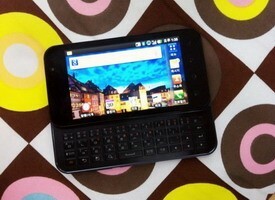 It's like the Optimus Black, but with a full sliding QWERTY keyboard and dual core CPU. According to the report, it's said to run on Android Gingerbread, and boast a 1.2GHz dual-core Tegra 2 processor, a 4-inch WVGA (800 x 480 pixels) NOVA screen. It has 5MP rear camera with an LED flash along with a front-facing VGA camera for video calls, 8GB of internal storage and WiFi Direct capability. 0 comments on "LG Optimus Note slider phone leaked in South Korea"